Pizza is a regular visitor to our house, only it doesn't usually come in the form of a delivery person. 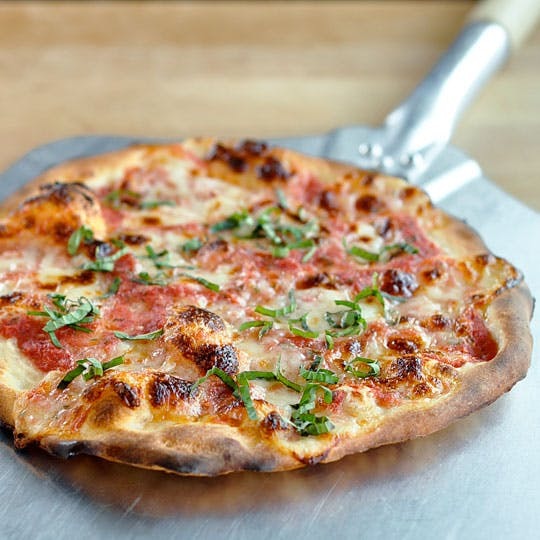 Making homemade pizza from prepared dough is a quick and easy dinner any night of the week. Even making your own dough only really adds a few minutes to the prep time! Pile on your favorite toppings and get ready to chow down. My favorite method for shaping the pizza is to roll the dough onto a piece of parchment paper. The dough sticks to the parchment, making it easier to work with and easier to transfer into the oven. The pizza will release from the parchment during cooking and the parchment can be removed halfway through cooking. The parchment darkens in the oven, but doesn't burn or catch fire. If you'd prefer not to use parchment, take a look at Method #2 or #3 below. There are also no rules about the kinds of toppings you put on your pizza. Choose ones you love. They will cook a little in the oven, but if it isn't something you like to eat raw, like sausage or mushrooms, allow some time to cook them ahead of time. If you'd like fresh greens, like arugula or basil, on your pizza, sprinkle them over the pizza right when it comes out of the oven. The residual heat from the pizza will wilt the greens just slightly and bring out their flavor. It's best, though, to keep the toppings to just a handful at most. If you load homemade pizza down with a ton of toppings, it may take too long for the crust to cook well. Pile on the cheese or keep it all veg for a healthier midweek meal; it's all up to you. Play around with this basic recipe and make it your own. Heat the oven to 550°F or higher: Don't be afraid to really crank the heat up to its highest setting. The high heat will help make a crunchier and more flavorful crust. Let the oven heat for at least half an hour before baking your pizzas. If you have a baking stone, place it in the lower-middle of your oven. Divide the dough in half: One pound of dough makes two 10-inch pizzas. Slice the dough in half and cover one half with an upside-down bowl or a clean kitchen towel while you prepare the first pizza. Method #1: Pizza Baked on Parchment: Tear off a large piece of parchment paper roughly 12 inches wide. Working with one piece of the dough at a time, form it into a large disk with your hands and lay it on the parchment paper. Use your hands or a rolling pin to flatten the dough until it is 1/4-inch thick or less. If the dough starts to shrink back, let it rest for 5 minutes and then continue rolling. 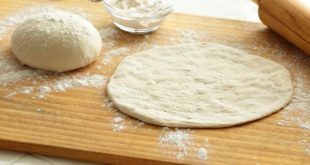 Method #2: Pizza with Cornmeal or Flour and a Baking Stone: Sprinkle a handful of cornmeal or flour on a pizza peel or the back of a baking sheet. Working with one piece of the dough at a time, form it into a large disk with your hands and lay it on the peel. Use your hands or a rolling pin to flatten the dough until it is 1/4-inch thick or less. 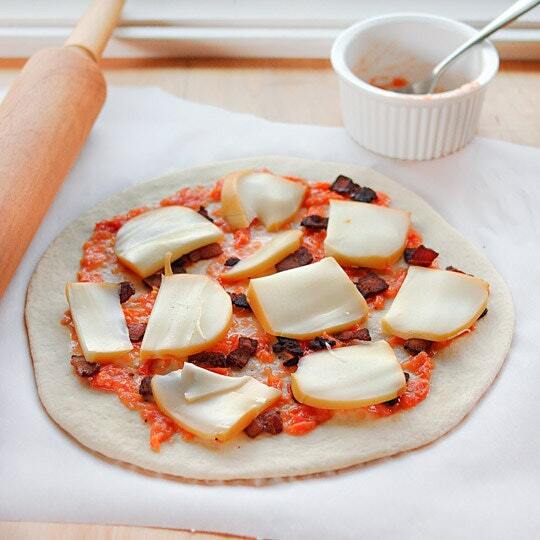 Shake the peel or baking sheet frequently as you shape to make sure the dough isn't sticking. If the dough starts to shrink back, let it rest for 5 minutes and then continue rolling. Method #3: Pizza Baked on a Baking Sheet: Brush a thin film of olive oil on a baking sheet. Working with one piece of the dough at a time, form it into a large disk with your hands and lay it on the baking sheet. Use your hands or a rolling pin to flatten the dough until it is 1/4-inch thick or less. If the dough starts to shrink back, let it rest for 5 minutes and then continue rolling. Top the pizza: Spoon a few tablespoons of sauce into the center of the pizza and use the back of a spoon to spread it out to the edges. Pile on all of your toppings. 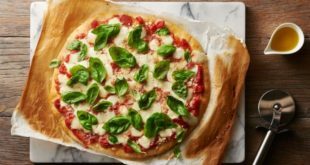 Bake the pizza: Using a pizza peel or the back side of a baking sheet, slide your pizza (with the parchment or with the cornmeal) onto the baking stone. If you don't have a baking stone, bake the pizza right on the baking sheet. Cook for 5 minutes, then rotate the pizza. Slide the parchment out from under the pizza, if used. 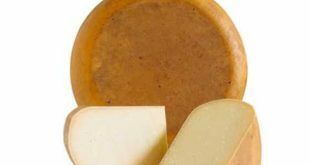 Bake for another 3 to 5 minutes, until the crust is golden-brown and the cheese looks toasty. Slice and serve: Let the pizza cool slightly on a cooling rack, just until you're able to handle it. Slice it into pieces and serve. Previous Which do you use Pizza Crust?